Want to see what I've been working on, almost exclusively, for the last 18 days? After today's gift exchange with my fiber buddies I can finally post these super secret projects. 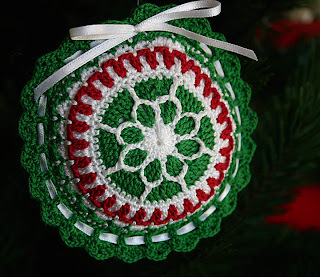 It's been a long time since I've done any thread crochet - working with such tiny hooks makes my hands ache - but these ornaments were too pretty to pass up. 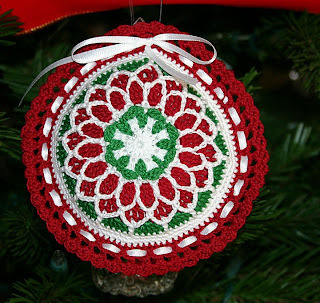 They are done with Size 10 cotton thread, a 1.75mm hook and the patterns in 'Scented Ornaments to Crochet' by Anne Halliday (Ravelry link). 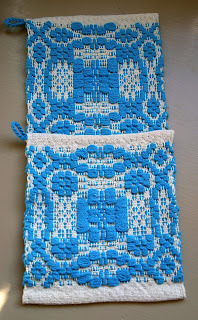 The center is a fabric bag stuffed with batting since I elected to make them unscented. Each ornament is approx. 4.25" in diameter and the front/back are identical. There are six patterns in the book and I'm working my way through all of them. 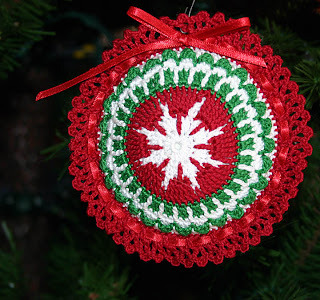 And even though my hands do hurt, I'm loving these ornaments and the intricacies of threadwork. 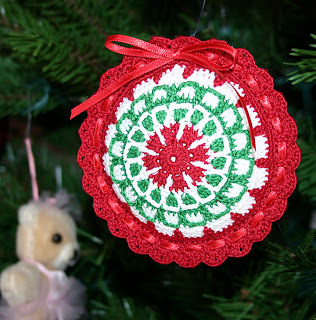 The ornaments were actually my back-up plan in case my original idea flopped on the loom; I'm thrilled that that didn't happen. 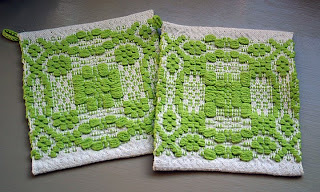 These are the overshot potholders from the May/June 2005 edition of Handwoven. All six were done on the same warp but I changed the treadling for the second in each color, giving them a different pattern. 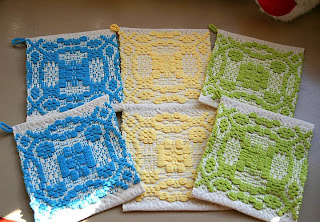 The potholders with the "X" in each corner (right side below) are treadled 'Star' fashion. You can see a diagonal line running between the top and bottom corners. Unfortunately, I forgot to release the tension before I cut the warp threads. Did you know that threads under tension can spring all the way across the loom, coming out of not only the reed but the heddles too? Not funny - and a definite rookie mistake. One I won't be making again, thank you very much. Oh, how lovely! 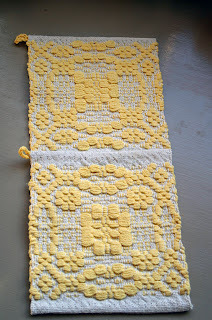 I don't have the patience for working in thread, but oh such beautiful results do tempt me!